The stylish L-shaped space saving Walnut Valencia 1100mm wide combination unit, perfect for renewing the style in any cloakroom, en-suite or smaller bathroom where space limited. It's stylish modern design hides all unsightly pipework creating a neat modern look. The WC unit can be drilled for right or left hand front flush. 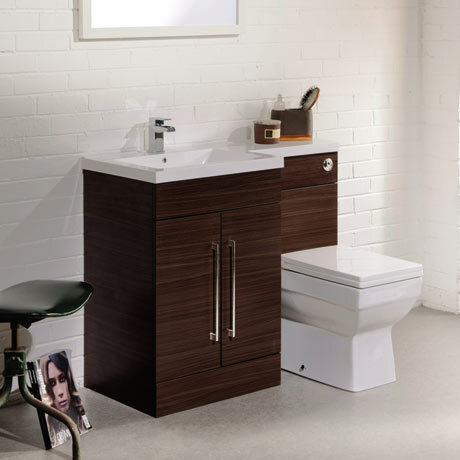 Features a beautiful Walnut wood finish, contemporary chrome effect handles, concealed cistern and a solid poly-marble square basin with worktop. Looks lovely in our new bathroom and all works perfectly. Helped us save space too as it's an all in one unit with storage underneath.